Implementation time and cost will vary by company but here are some guidelines. The larger the company, and the older the company, the longer it is likely to take to change past management practices and train people. This is training with some remote support for Q & A and design. Courses are offered online with video for most Systems, others are done live to integrate the company's needs and customize, as well as to "sell" the team on the benefits and get total buy-in to the Systems. We provide a complete plan with calendar of events for entire process. 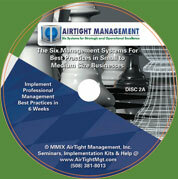 Allow 6 to 8 weeks per System. Some may be done in parallel but most need to be done one at a time. Of course, this depends on your staff size and their availability and capabilities. On-Site Training with Discovery and Assessment of the management team plus a custom plan for implementation. Remote consulting for design and coaching as needed by individuals in charge of the project (not all team members). This methodology provides more customization and support. We will evaluate the needs and develop a custom plan of implementation including a training program for each management team member. You will provide a Project Leader, usually the CEO in small companies or a President or COO in companies with that staff. We will do discovery and design (i.e. dashboards for corporate and each department) where experience is critical due to the art involved. Complete On-Site Training and Implementation - We take total responsibility for the Project Management and results of each System. We guarantee results when our experts can design and manage the process, coach your team members individually as needed and integrate each System into your culture. Discover, design and oversee all implementation steps and processes like: training for individuals, coaching in management meetings, facilitating the Strategic Planning process, setting up the needed processes like Annual and Quarterly Budgeting reviews, and even deliver complete Strategic Plan (optional with System #1) working with your team while "teaching them to fish". 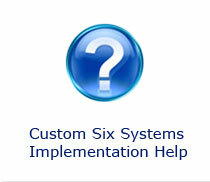 Individual Systems - Done over 4 to 6 weeks per System with a two day visit for each System for training. Design and implementation is usually done remotely after discover to interview all key staff members to develop the design. We will evaluate your current systems and processes and integrate any or all of our six Systems as needed on a mutually agreed schedule and fixed price budget. Ready to Create a World-Class Company and Team To Scale a Proven Business Model? Every Company Varies but often Phase I is Implementing Systems 1-3 – #1 - Strategic Planning, #2 - Management Best Practices (PAMS = Performance, Accountability and Merit System) and Dashboards over a period of 18 to 24 weeks. Deliverables include a complete Strategic Plan and the team is trained to update and align with this in monthly and quarterly management processes. Your corporate value creation, competitive position, market share and revenue will begin to soar with long-term value/equity creation, more recurring revenue, productivity and even better morale and lower turn-over of key people. Phase II is often Systems #4 to #6 – Strategic Budgeting, Process Documentation and Human Capital Acquisition and Development (HCAD). These are more cultural and require more customization and documentation but can generally be done in a six month period also when it is a priority for the team with proper leadership. Note that each engagement is different and customized. We will set up a specific project plan, schedule and estimate after discovery. Then we will proceed in a way that is optimum for your situation and team and stay on budget. All on-site engagements include our complete CD training set and Implementation Kit License with all files for those systems implemented. This is to insure proper training of new employees and promoted employees who come in after the training is completed.